Researchers at Dalhousie University’s Faculty of Agriculture believe what Hippocrates (460-377 B.C. ), the father of medicine, stated thousands of years before, "Let thy food be thy medicine and thy medicine be thy food." Dr. Vasantha Rupasinghe, a Canada Research Chair in Fruit Bioactives and BioProducts and his team have begun a new research initiative to investigate the disease fighting power of the newest cool climate fruit crop in Nova Scotia, Haskap. Also known as blue honeysuckles and honeyberry, Faculty researchers and industry partner Lahave Forest Farm Ltd are developing a “super food” that may help preventing chronic disorders such as cancer if consumed daily along with other good life style practices. Dr. Rupasinghe and his research team believe, prevention is the most cost-effective, long-term approach for controlling cancer. “There is strong scientific evidence that the natural dietary agents of fruits and vegetables have the potential to reduce the risk of cancer development by decreasing the oxidative stress,” explained Dr. Rupasinghe. Deaths from cancer worldwide are projected to continue rising. The World Health Organization has estimated there will be 13.1 million deaths in 2030 due to cancer. Lung cancer is one of the major types of cancer causing the most cancer death worldwide. Even after chemotherapy, survival rate after five years of identifying lung cancer is less than 14 per cent. Side effects due to lung cancer treatments are also very severe. Haskap may be the answer. 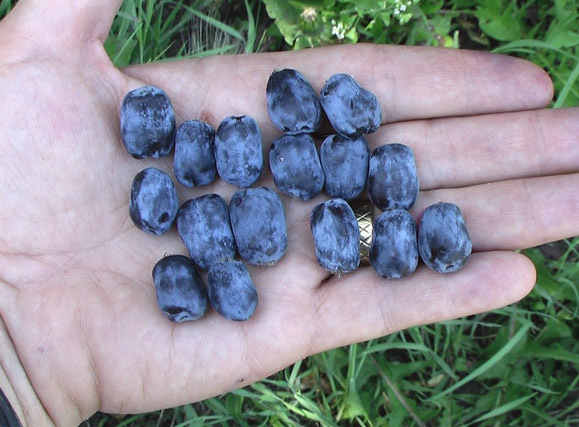 A berry crop new to Canada, Haskap is extremely rich in dietary antioxidants such as flavonoids. Haskap fruits also have great beneficial health molecules that have been used to treat many diseases in other countries such as Northern Russia, Japan and China. “To test this, first we will use lung cells grown under laboratory conditions. Further, we will test the anticancer activity of haskap bioactives using human lung cancer cells,” explained Madu. At a subsequent experiment, researchers will feed haskap bioactives to mice and expose them to a carcinogen while feeding a haskap bioactives supplemented diet. To test the cancer preventative ability of haskap, they will measure the size of tumors, different proteins and activities of various enzymes in mice lung tissues. “We hope that this study will help us to develop cancer preventive food products as well as educate the public about cancer preventative dietary habits,” added Dr. Rupasinghe. LaHave Forests Farm Ltd has 60 acres of haskap orchards with plans to plant an additional 20 acres each year. The company is selling plants and encouraging other farmers in Nova Scotia and beyond to plant the berry with the vision of creating a new berry crop for the region.